Assessing F1 drivers is bound to be a subjective matter to some extent but there are certain things we can be reasonably sure of. Drivers do not change in ability from one year to the next, for instance; they may get better over time as they learn the ropes, but they do not change with the seasons from excellent to hopeless or vice versa. So we can say with some certainty that, if Jenson Button is proving to be the smoothest and calmest driver this season, he has been so for at least several years before. The reason his talents went unnoticed by most in 2008 and 2007 was, of course, the fact that Honda gave him a complete dog of a car. But that does not entirely explain his sudden transformation into team leader over Rubens Barrichello. 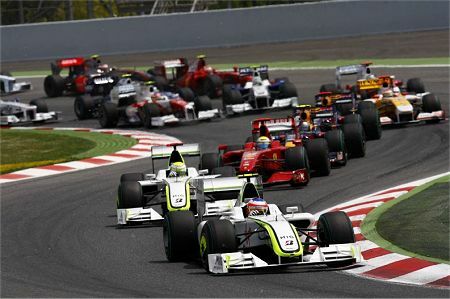 This year Jenson has dominated his experienced team mate to the point where Rubens is wondering just what he has to do to beat the Englishman, yet in 2008 the Brazilian fared rather better in the awful Honda RA108. This forces us to the conclusion that Rubens is able to extract more from a bad car whereas Jenson's talent surfaces when the car is good. That may well be a matter of driving style, Button being unable to be brutal enough with a car that does not want to perform and Barrichello happy to drive it sideways if necessary. A similar situation was seen last year in the BMW team, with Heidfeld unwilling to throw the car around enough to heat its tires quickly whereas Kubica's more ragged style suited much better. We might be tempted to say that it is the car that is winning the championship, therefore, and that Button is little more than a passenger. This is partially true in that Button would not have won races so consistently without a car that suits his style; but it is wrong to think that anyone could have done the same in the Brawn BGP 001. Barrichello was, on occasion, quicker than Schumacher yet he has not managed to win in the Brawn so far and, unless Button makes a mistake or has a mechanical failure, it does not look as if Rubens will get a single victory this year. I think we must conclude that Jenson is one of the best when the car suits his style, therefore. Although the Brawn driver pairing has only a few races under its belt so far, Button is actually doing a better job on Barrichello than Schumacher managed, even though Michael had the benefit of being always the favored driver. Which is not to say that I think Button should be placed amongst the elite of drivers like Senna, Schumacher, Stewart and Nuvolari. The greatness of such drivers lay in the fact that they could win even when supplied with machinery that was far from the best. Of all the present crop of drivers, only Alonso stands out as being in that mold, although Hamilton may stake his claim in the months to come. But that does not mean that, if you put Alonso in Barrichello's seat, he would beat Button every time. Jenson is so well suited to the car that he might still have the beating of the great Spaniard; certainly, Alonso's style is not so perfect a fit with the characteristics of the BGP 001. It would be an interesting battle, nevertheless. When it comes to the question of whether Button "deserves" to be champion this year, I think we have to conclude that he does. He is part of the package that has made Brawn GP almost unbeatable to date and that is not something that any F1 driver could have done. Barrichello, too, has had his part to play and his supporters can point to the sharing of settings that has helped Button on more than one occasion. To my mind, however, this just makes him resemble even more a certain driver of the recent past, a man who never became champion but was instead perhaps the greatest number two of all time. That can only mean Riccardo Patrese, of course, and Rubens does begin to look very much like him. Both did their apprenticeships in lesser teams where the rewards were few and both spent the last years of their careers as experienced and solid drivers who helped their teams to greater success. It may be no coincidence that it was Patrese's record for the most GPs that Rubens took so recently - long service may be the common denominator between all the great number twos. And there lies the rub; Rubens does not want to be regarded as a number two. One can understand his feelings in view of his many years as Schumacher's back up but he may find it easier to take a leaf from Patrese's notebook. In all his years as a number two, Patrese was uncomplaining and just happy to have a drive - but he was always there to pick up the pieces if the lead man faltered. And so he won the occasional race here and there and smiled whatever fate sent him. I cannot help but feel that Rubens would do well to adopt Patrese's attitude in his present situation. The complaining and looking for reasons for failure does not help anything and makes him seem a whiner. How much better it would be to quietly get on with the job and then take the opportunities when they appear. That is more likely to earn him another year with Brawn GP, at any rate. If you win the most races and score the most points, you are very deserving of the title. Racing is about achieving results. Fans sometimes get sidetracked creating theories about this or that. But, results are what count in racing. That is my 2 cents worth, which in this tough economy is only worth 1 cent. Aracer: And a very good two cents worth it is! I couldn't agree more. Clive, I think you're missing out on some drivers who have changed, and I think Raikkonen is the perfect example. I'm not saying his driving style has changed or that he isn't as good a driver, but clearly his mental state has changed, and that has affected his ability to perform at his peak. I don't think Kimi, like, perhaps, Villeneuve, is the kind of driver who needs an ideal car to win. He would have won a WDC with McLaren if not for reliability issues, I just think his head-space has sapped his motivation, and that is a factor in a drivers performance one year to the next. It could be argued that Button is more motivated now after paying his dues, while Ruebens is suffering from a bit of "dammit, why him and not me?" all over again. Motivation is key, and if it's gone, so is the drivers ability to be at the top of his game. Lauda knew that when his was gone, it was time to walk. I'm not saying Kimi needs to go, but someone might make that decision for him before too long. Arnet: Yes, Kimi does appear to be the spanner in the spokes of my argument. But, even though his motivation seems to have drained in the last couple of years, he had enough for the championship in 2007, suggesting that he did not go from being the acknowledged quickest driver in F1 to a barely competent journeyman overnight. And he is still capable of winning races if he decides to wake up for the day. To return to Kimi, I think Luca already has Alonso pencilled in for next year and the team typist has the draft of Kimi's goodbye letter. I think Button is one of these drivers whose performance ratchets up a level when he gets a chance of winning. Last year Rubens had him covered and I think that is why he is so upset now. He thought if the car was competitive he would have the edge and clearly he does not. I disagree about Kimi. I don't think there is anything wrong with his driving or his motivation. At Monaco where he could force the car to work in a manner he liked he was seriously competitive however this season like last season the car simply cannot be set up to suit his driving style. The Ferrari as recent Ferraris have tended to be is an understeerer and is much more suited to Massa's style. Kimi needs the front end to stick and the rear to move and the Ferrari is not at all keen to do that. Like the McLaren when the rear does step out of line it tends to do it in an unexpected and violent manner. Put Kimi in a reasonably well handling car that can be dialled into operating with his style and he will be competitive again. Villeneuve simply got demotivated after spending years in bad cars. It is the same as Button. In a bad car he was not dominating Rubens but in a good car all of a sudden he is looking like th driver Prost described when he tested him as a rookie. Steven: I think that is a fairly accurate reflection of Barrichello's true feelings regarding this season. It is certainly easy to understand his frustration! I would be more inclined to believe your theory on Raikkonen had he not gained our respect in the first place by taking the fight to Schumacher so often in an uncompetitive McLaren. The fact that he could do so in those days but now seems unable even to get the best from a fairly handy Ferrari speaks to me of a loss of motivation. His style may have something to do with it but, essentially, I think the problem is really in his head. Clive:All uncompetitive cars are not equally uncompetitive or the same to all drivers nor or all teams equally cooperative with drivers unhappy with their cars. Ferrari is famous for inner squabbles. Kimi Raikonan is famous for being inexpressive. This would seem to lead to a basic incompatibility. I believe Jenson benefits from the option tire rule. In race after race we have seen him get more from the lesser tire choice than almost anyone. Yes the Brawn does seem to be easier on it's tires than the others, but we have also seen Rubens use up tires at a faster rate than Jenson. I have often heard that Clark could win races with more tread left on his tires than anyone else because he was so smooth on and off the power and easing the car through the corners. While it 's way too early to compare Jenson to Clark ( who should have been at the top of your list of greats :-( ) he does seem to be able to go faster than the others while taking better care of his tires. Since the object of any driver in a race or championship is to beat the rest with the tools you are given, this year Jenson fully deserves the championship, should he win it, because he is simply going faster than anyone else including Rubens, a very good driver with the same equipment. Nick: All too true. I have always felt that Ferrari and Kimi was an unnatural fit, regardless of their mutual statements of compatibility. It can surely be no coincidence that he seemed a different driver from the moment he started with the Scuderia. Lonny: Actually, there was a reason I did not include Clark in that list. I pondered it briefly and then put Nuvolari down instead. The reason for that is that Clark always drove for Lotus and never had a completely uncompetitive car as a result. He might have been very good in such a situation but we just don't know, whereas Nuvolari spent most of his career extracting phenomenal performances from inferior or difficult cars. I have to disagree on part of your assesment. While Button has proven to be a better driver then I originally thought, I would hesitate to start comparing him to Schumacher, Senna and the like. Button is doing a great job in the best car. True he was saddled with garbage for most of his career but I can't help but thinking one of those all time greats may have eked out something noteworthy. I think to properly judge Button, he needs to be in a good car but not quite the best. Then we could see if he could wring something special out of it. Steve: Actually, that is exactly what I was saying. I gave reasons why we cannot put Button amongst the greats and made the point that change in a driver is gradual, not sudden from one season to the next. As for Barrichello being past his prime, I think Rubens would argue with that. Although I agree that he has probably passed his peak, he himself has said that he is driving better than ever before. Not that it matters, anyway - I am comparing his performance this season with that of Button's and, so far, he has been found wanting. I will remind you that Clark drove the Lotus-BRM H16 in 1966 and actually won the US GP with that load. He also showed quite well at Indy in '63 or '64 with a stock block Ford powered Lotus that was underpowered compared to the competition. I think, though I am not a fan, that Hammie is learning to adapt his skills to the situation which will eventually make him an even better driver. He may well be a "great". We'll see. The other way in which Button seems to imitate Clark is that once he has taken a lead, he only wins by as much as he needs to, sparing the car. I think 3 wins on the same engine is perhaps the most remarkable thing he has done so far. Lonny: The BRM H16 was actually an extremely powerful engine as long as it kept running. The problem was that it didn't run for long without going bang. The fact that Clark actually managed to make it last a race distance (once) says more for his mechanical sympathy than for his ability in less competitive cars. The car was good, the engine hopelessly unreliable. The Indy Lotus was underpowered compared to its opposition, yes, but it handled so much better (Chapman was demonstrating to the States why it was a good idea to put the engine in the back of a light and handy car) that it too does not qualify as an uncompetitive car. Chapman's cars may have been fragile but they were never uncompetitive while running. Agreed about Hamilton and Button, however. Rubens may argue with that but I would wager that most unbiased observers would side with me. If Barrichello thinks he is driving so well, lets see how many teams will be interested in him next year. The proof is in the pudding as they say. Poor old Rubens. Sadly, I think you're probably right, Steve. Fame and headlines for a driver comes a goes with the number of visits to the rostrum. I don't understand why people is now praising Button's driving style while driving the best car; he already show his quality over the years. No question Button could win several titles if provided with the right car. It bothers to read how good or bad a driver is based on a few recent races; the quality is there folks and anyone may have a perfect or disasterous race weekend but the quality of driving is, on average, there on every race. The bottom line here is thqt Button is on top because of his smooth driving style; he gets the best from the car because the extracts the most without getting out of the limits; that's the secret....the key for finishing a race without making mistakes. What's the place of Button in F1 history? it's yet to be seen. I think he's got a top one spot based on dedication and selflessness when he lost time, lots of money, and credibility by sticking to a "hard-to-believe" plan at Honda-Brawn; to my knowledge, he's the only driver in doing so. And now that the shortsightness of the "F1 scouts" have been able to "discover" the talent of Button, for sure he will keep driving good cars from now on. What other talents are there unable to be converted into podiums? Of course Alonso is on the top of the list; He has become the most complete racer on the grid and yet the only guy unable to be offered a top car during the last two years. Macca denied him his third WC by betting on a marketing-national pride strategy to make history with Hamilton on his rookie year. The worst part fell into Alonso's shoulders and still today he's suffering the exile at Renault due to a false fame created by Dennis and the Hamilton's lack of respect. Another driver? I think Nick Heidfeld and in the years to come Timo Glock. Benalf: I agree essentially, although I think you're a bit hard on Hamilton. He has proved that he can drive a good car quickly and is now showing that he can do things with a poor car too. In time, I think be will be recognised as one of the best. A great comment, Benalf, very well reasoned. Thank you.